One of the key roles and responsibilities of an Engineering Technician is to assist engineers in creating products, projects, and solutions. 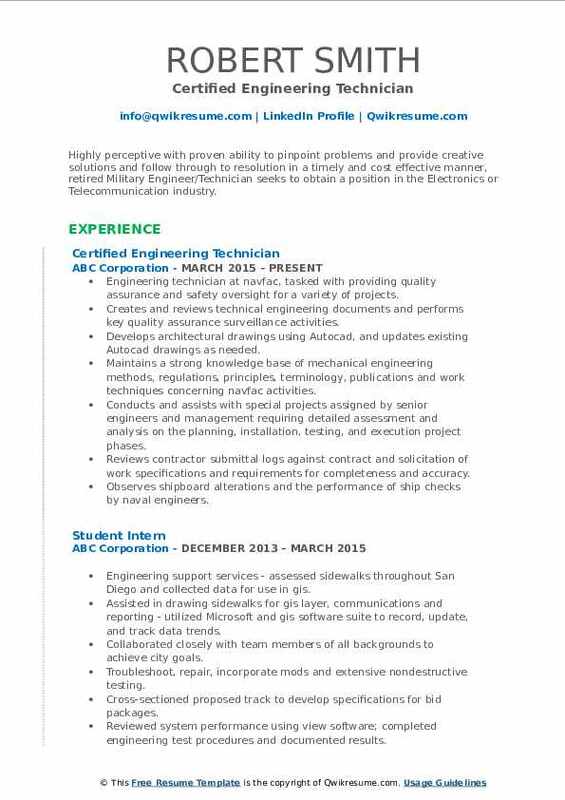 Apart from this, some of the other important job tasks that can be found on an Engineering Technician Resume are: to work alongside engineers in developing and debugging projects, assist the design team whenever needed, solve technical problems, look at issues from a technical point of view, etc. If you are interested in applying for this challenging job role, there are certain qualifications that are expected – such as exceptional technical knowledge, experience in quality control testing, data collection abilities, and an obvious urge to be a good team player. While the minimum education required for this role is a Bachelor’s Degree in Engineering, a Master’s Degree and relevant work experience are considered to be a great bonus. Headline : Skilled maintenace professional with proven ability in mecnical and electrical operation and repair. Demonstrae talent or troubleshooting, identifying and solving problems with the aptitude to recommend strategies to improve performance. Known for quality, timely completion of projects, along with the ability to balance competing priorities and tight deadlines. Posses clear and concise communication skills; in addition to outstanding interpersonal skills. Assisted with engineering on new ways to build upcoming etch dual-chamber systems. Built and tested semiconductor systems for applied materials CMP and etch departments. Maintain a good working relationship with external customers and ensure customer confidence is critical. Maintain statistical data on associated work and product lines, perform analysis, and report trends. Tested electrical signaling components and boxes used for RR signaling located throughout the united states at RR crossings. Analyze test results and report findings to the engineer in charge of the product. Including configuration check, proper test equipment configuration, and proper test documentation, including test procedures and test reports. Summary : Excellent ability to develop working relationships with regulatory bodies, commissions, and local government officials. Comprehensive knowledge of urban planning principles. Outstanding technical skills, exceptional communication and writing skills. Skills : Leadership, Management, And Consulting., Heavy Equipment Operation, Backhoe, Excavator And Skid Steer. 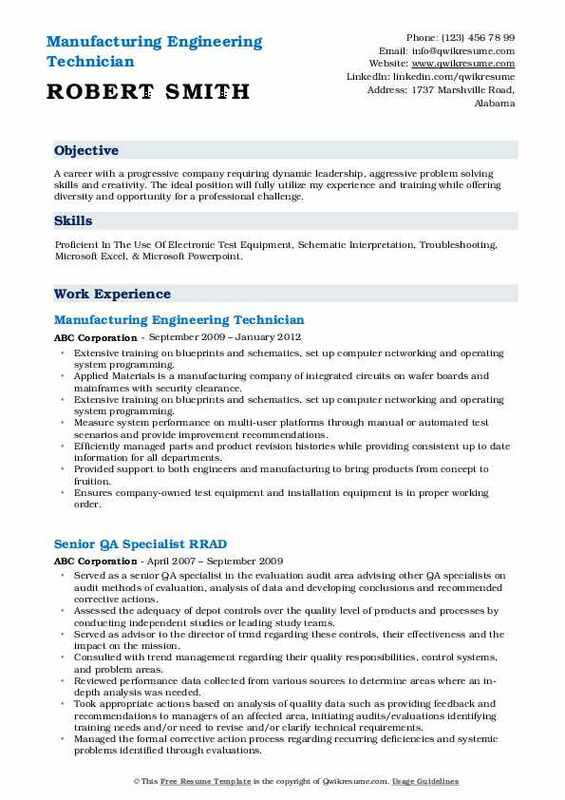 Assisted system engineer in developing test plans, test matrices, and test files. Executed manual and automated tests of the software in accordance with established testing protocols to ensure quality and compliance with stated specs/ requirements. Worked very closely with the engineering staff to troubleshoot /debug issues that occurred in product development. Analyzed test results and communicated with engineers to assist in problem resolution. Executed regression test to compared device performance against previous software releases to detect issues in a current software release. Managed software bugs through bug submission, prioritization, progress tracking, and fix validation through creo engineering Sharepoint database. Modified and implemented engineering test matrices to keep with changing configurations. 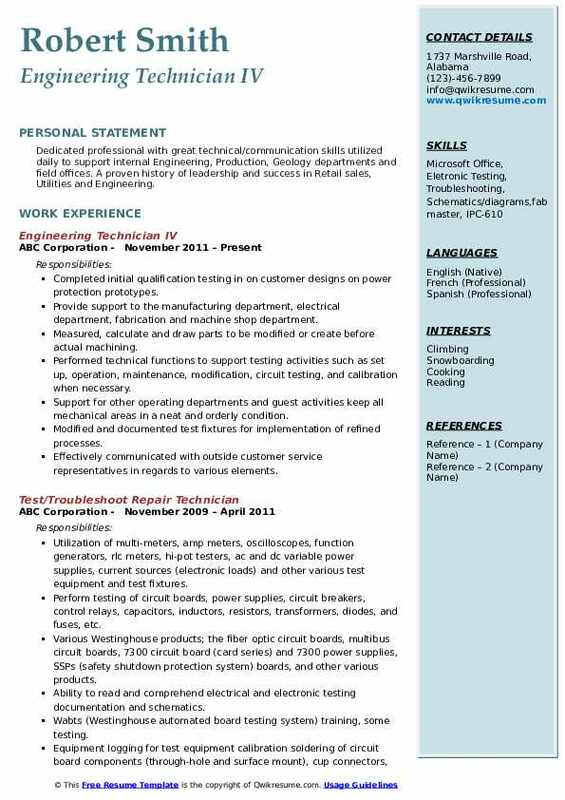 Summary : Test Technician seeking full time employment. Have broad electronics and mechanical experience gained in the manufacture, test and debug of circuits and assemblies for digital communication systems and electronic devices. Have strong computer programming and networking skills. Designed and documented improvements to existing systems for increased production. Maintained and repaired production equipment such as environmental chamber and flow bench simulator. Developed close working relationships with both government and subcontractor representatives to resolve countless installation and configuration issues. Conducted testing of completed systems and ensured the reliability and accuracy of mission essential data. Coordinated with other supply activities and local depots to procure equipment and associated materials. Maintained equipment, worked with internal customers, work from complex product drawings, manuals, specifications, and other company / customer specifications. Developed the ability to trouble shoot issues with minimum supervision to resolve technical issues and ensure rapid customer response. 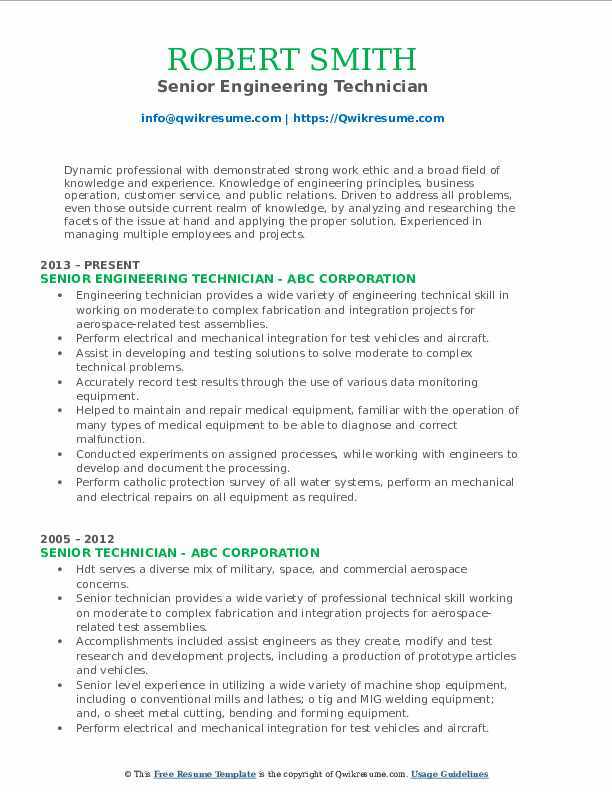 Headline : Highly perceptive with proven ability to pinpoint problems and provide creative solutions and follow through to resolution in a timely and cost effective manner, retired Military Engineer/Technician seeks to obtain a position in the Electronics or Telecommunication industry. 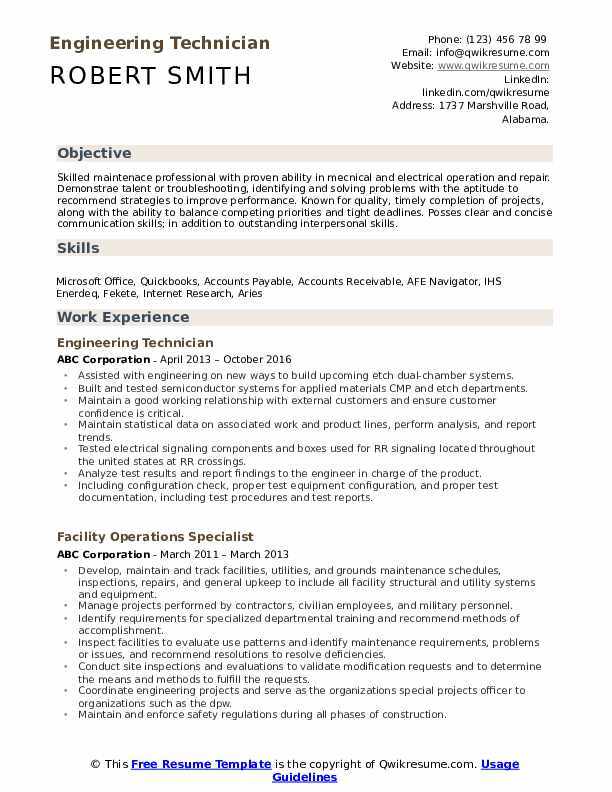 Engineering technician at navfac, tasked with providing quality assurance and safety oversight for a variety of projects. Creates and reviews technical engineering documents and performs key quality assurance surveillance activities. Develops architectural drawings using Autocad, and updates existing Autocad drawings as needed. Maintains a strong knowledge base of mechanical engineering methods, regulations, principles, terminology, publications and work techniques concerning navfac activities. Conducts and assists with special projects assigned by senior engineers and management requiring detailed assessment and analysis on the planning, installation, testing, and execution project phases. Reviews contractor submittal logs against contract and solicitation of work specifications and requirements for completeness and accuracy. Observes shipboard alterations and the performance of ship checks by naval engineers. Evaluates drawings for completeness and accuracy, and troubleshoots issues in a timely manner. Summary : Dedicated professional with great technical/communication skills utilized daily to support internal Engineering, Production, Geology departments and field offices. A proven history of leadership and success in Retail sales, Utilities and Engineering. Completed initial qualification testing in on customer designs on power protection prototypes. 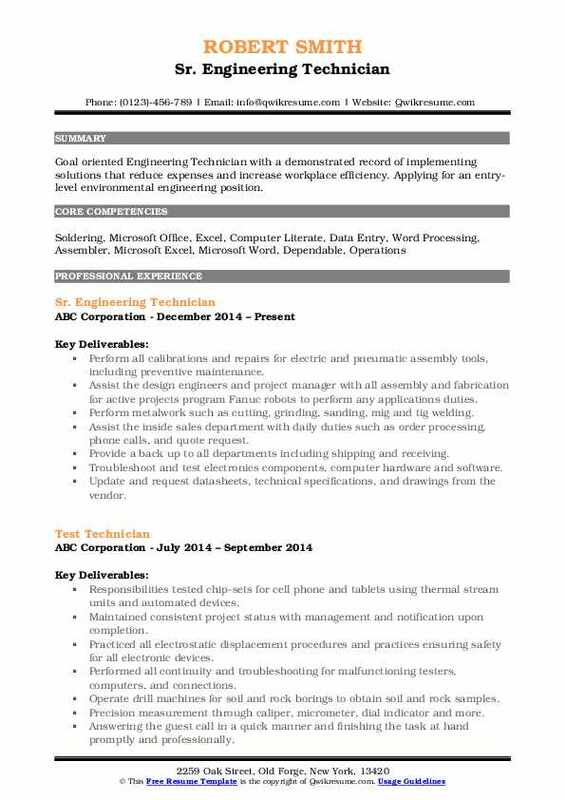 Provide support to the manufacturing department, electrical department, fabrication and machine shop department. Measured, calculate and draw parts to be modified or create before actual machining. Performed technical functions to support testing activities such as set up, operation, maintenance, modification, circuit testing, and calibration when necessary. Support for other operating departments and guest activities keep all mechanical areas in a neat and orderly condition. Modified and documented test fixtures for implementation of refined processes. Effectively communicated with outside customer service representatives in regards to various elements. Objective : A career with a progressive company requiring dynamic leadership, aggressive problem solving skills and creativity. The ideal position will fully utilize my experience and training while offering diversity and opportunity for a professional challenge. Skills : Proficient In The Use Of Electronic Test Equipment, Schematic Interpretation, Troubleshooting, Microsoft Excel, & Microsoft Powerpoint. Extensive training on blueprints and schematics, set up computer networking and operating system programming. Applied Materials is a manufacturing company of integrated circuits on wafer boards and mainframes with security clearance. Measure system performance on multi-user platforms through manual or automated test scenarios and provide improvement recommendations. Efficiently managed parts and product revision histories while providing consistent up to date information for all departments. Provided support to both engineers and manufacturing to bring products from concept to fruition. Ensures company-owned test equipment and installation equipment is in proper working order. 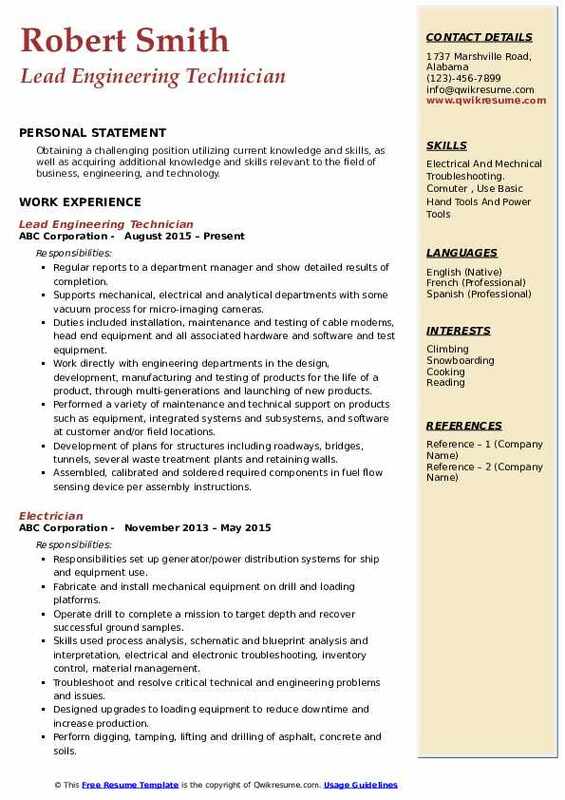 Summary : Dynamic professional with demonstrated strong work ethic and a broad field of knowledge and experience. 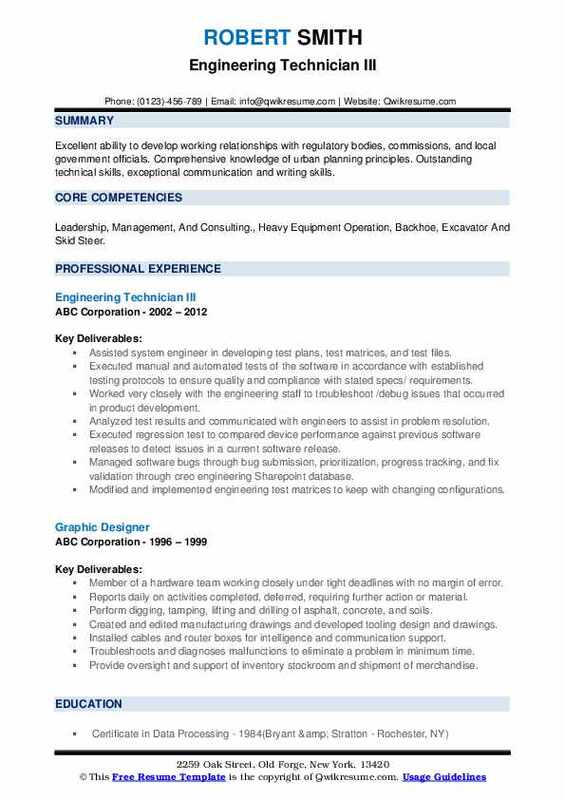 Knowledge of engineering principles, business operation, customer service, and public relations. Driven to address all problems, even those outside current realm of knowledge, by analyzing and researching the facets of the issue at hand and applying the proper solution. Experienced in managing multiple employees and projects. Engineering technician provides a wide variety of engineering technical skill in working on moderate to complex fabrication and integration projects for aerospace-related test assemblies. Perform electrical and mechanical integration for test vehicles and aircraft. Assist in developing and testing solutions to solve moderate to complex technical problems. Accurately record test results through the use of various data monitoring equipment. Helped to maintain and repair medical equipment, familiar with the operation of many types of medical equipment to be able to diagnose and correct malfunction. Conducted experiments on assigned processes, while working with engineers to develop and document the processing. Perform catholic protection survey of all water systems, perform an mechanical and electrical repairs on all equipment as required. Objective : Goal oriented Engineering Technician with a demonstrated record of implementing solutions that reduce expenses and increase workplace efficiency. 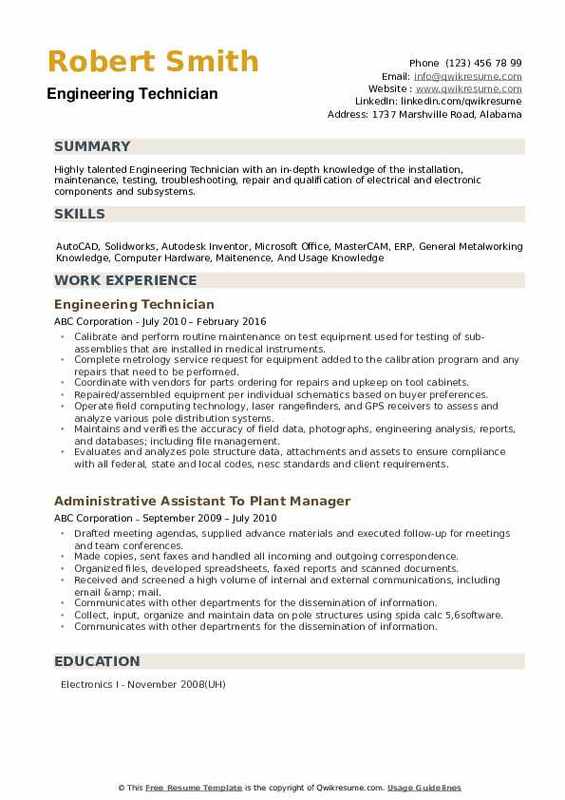 Applying for an entry-level environmental engineering position. Perform all calibrations and repairs for electric and pneumatic assembly tools, including preventive maintenance. Assist the design engineers and project manager with all assembly and fabrication for active projects program Fanuc robots to perform any applications duties. Perform metalwork such as cutting, grinding, sanding, mig and tig welding. Assist the inside sales department with daily duties such as order processing, phone calls, and quote request. Provide a back up to all departments including shipping and receiving. Troubleshoot and test electronics components, computer hardware and software. Update and request datasheets, technical specifications, and drawings from the vendor. Use automated testing to verify harnesses and panels, troubleshoot any errors. Headline : Obtaining a challenging position utilizing current knowledge and skills, as well as acquiring additional knowledge and skills relevant to the field of business, engineering, and technology. Regular reports to a department manager and show detailed results of completion. Supports mechanical, electrical and analytical departments with some vacuum process for micro-imaging cameras. Duties included installation, maintenance and testing of cable modems, head end equipment and all associated hardware and software and test equipment. Work directly with engineering departments in the design, development, manufacturing and testing of products for the life of a product, through multi-generations and launching of new products. Performed a variety of maintenance and technical support on products such as equipment, integrated systems and subsystems, and software at customer and/or field locations. Development of plans for structures including roadways, bridges, tunnels, several waste treatment plants and retaining walls. Assembled, calibrated and soldered required components in fuel flow sensing device per assembly instructions. 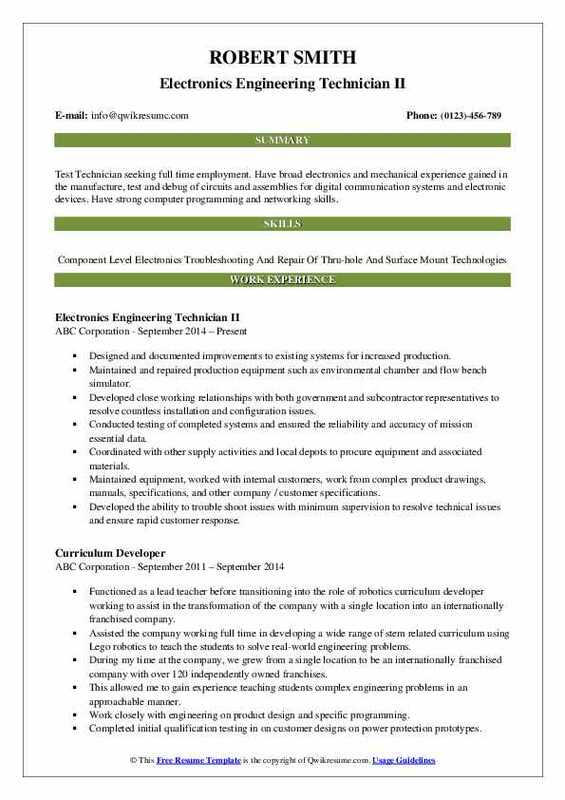 Headline : Highly talented Engineering Technician with an in-depth knowledge of the installation, maintenance, testing, troubleshooting, repair and qualification of electrical and electronic components and subsystems. Calibrate and perform routine maintenance on test equipment used for testing of sub-assemblies that are installed in medical instruments. Complete metrology service request for equipment added to the calibration program and any repairs that need to be performed. Coordinate with vendors for parts ordering for repairs and upkeep on tool cabinets. Repaired/assembled equipment per individual schematics based on buyer preferences. Operate field computing technology, laser rangefinders, and GPS receivers to assess and analyze various pole distribution systems. Maintains and verifies the accuracy of field data, photographs, engineering analysis, reports, and databases; including file management. Evaluates and analyzes pole structure data, attachments and assets to ensure compliance with all federal, state and local codes, nesc standards and client requirements.